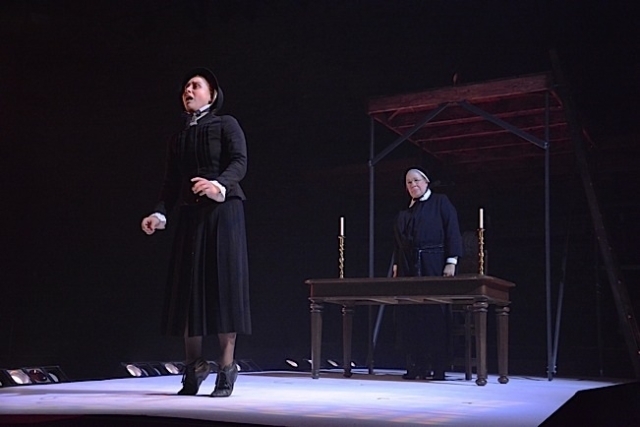 New Epic Theater has staged an absorbing production of Doubt: A Parable by John Patrick Shanley. The 2005 play won both the Tony Award for best play and the Pulitzer Prize for Drama. 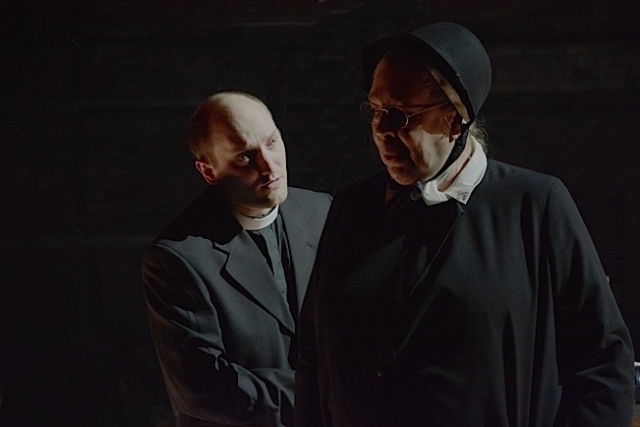 What makes Doubt work on stage is that it keeps you guessing whether or not Father Flynn, a young Catholic priest who oversees a parish school’s young boys, molested one of them. It pits him against an overbearingly puritanical mother superior who sees the worst in everyone, seriously. Sister Aloysius is one of the most cynical figures of contemporary drama, and, not surprisingly, she jumps to conclusions about where she thinks Flynn’s sexual proclivities run. Or does she? That is the question. Director/set designer Joseph Stodola definitely keeps us guessing and he keeps the action clipping along so that we admire the tight structure of the writing. This ironically was not the case when Shanley himself self-destructively directed the film version with Meryl Streep, not at her best, and the disastrous miscasting of Philip Seymour Hoffman as Flynn. I mention the film because audiences ought to run to see this brilliant production because New Epic reminds us that Doubt is one of the great plays of our time and now, regrettably, too many people’s image of it is far from that thanks to Shanley’s own film. Adam Qualls brings a delicate kind of strength to Flynn. He reveals a man who cares deeply about boys and the hurtful things thrown their way that adults, male and female, too often tend to dismiss as unimportant or as “boys will be boys.” Of course, a man who cares about boys and shows them kindness and affection is often, tragically, misunderstood by the cruder, blunter forces in our world. But Sister Aloysius has her doubts. She has a tendency to project illicitness onto things beyond her grasp. She is also a scarred soul with piercing intelligence. Whether you ultimately take her side or not, or stand neutral, Shanley definitely shows how easy it is to poison anyone’s reputation with innuendo and insinuation. Claudia Wilkens as Aloysius is magnificent, bristling with intimidation and smug righteousness. For those of us old enough to have known haughty matrons born in the early part of the 20th century or before, you will recognize qualities of that generation in Wilkens’s uncanny portrayal. Austene Van is in top form as Mrs. Mueller, the mother of an African American boy who Flynn has taken under his wing. The boy, never seen in the show, is also beaten by his father who cannot bear that his son is not adequately masculine. The famous toe-to-toe face off between Mrs. Mueller and Sister Aloysius is breathtakingly rendered by the actresses. Aeysha Kinnunen, in a sterling performance, emphasizes the submissive quality of the impressionable young Sister James who is catapulted into an ugly adult world of judgment, politicking, and mental bullying. She represents the part of us that wants to see the best in people, though the facts appear to point in the opposite direction. Kinnunen poignantly conveys the partial implosion of a young woman’s idealism. Stodola’s striking set uses scaffolding and construction materials to severe effect. Mary Shabatura’s gorgeous cathedral-esque lighting bathes the set in an other-worldly visual balm.